We were privileged last weekend to host three Franciscan Volunteers who were visiting us from Camden, New Jersey. They are part of a program sponsored by our province called Franciscan Volunteer Ministry. It allows young people, typically just out of college, to spend a year in ministry and prayer in one of three locations: Philadelphia (where I was an FVM in 1993-1994, and where I first encountered the friars, and which led to my eventual vocation as a friar); Camden, NJ; and Silver Spring, MD. The three Camden FVMs spoke to our youth group on Sunday night about their experience serving at a school in inner-city Camden, and how it has deepened their prayer life and brought them closer to people who are often ignored or forgotten in our culture. We were happy to host them for the weekend. If you know of anyone who might be interested in the program, please visit www.franciscanvolunteerministry.org for more information. We have a new staff member who joined us this past week. Her name is Connie O’Sullivan, and she is our new Coordinator of Stewardship and Advancement. We welcome Connie and we’re glad she is with us. This coming week a number of our staff will be spending a day and a half offsite on retreat. Please pray for us as we spend some time away. And a final note – as this column was going to press, Jennifer Bigelow, who has served as the principal of our school for the past eight years, announced early Tuesday morning that she has accepted a new position as the Superintendent of Schools for the Diocese of Arlington, Virginia. Let me say thank you to Jennifer for her years of service here and we wish her the best as she moves into her new position. 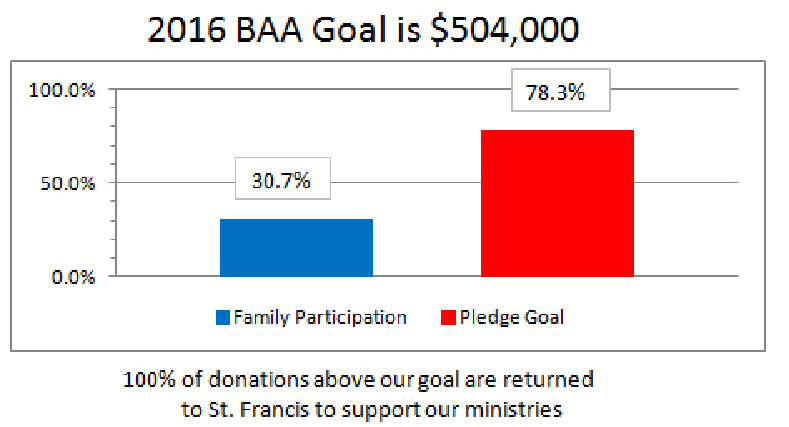 Thank you once again to all who have contributed to our 2016 Bishop’s Annual Appeal. We will have a wrap-up weekend in a few weeks. And Happy Mother’s Day! Blessings on your week….